0 Y LIN SCALE EN – Enables linear scales for the Y-axis. 1 Y INVRT LN SCL – Inverts the Y-axis linear scale. 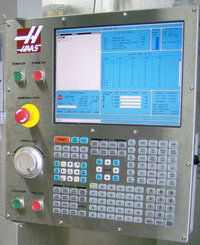 6 Y AXIS DELAY 0 – When set, indicates that this axis should be zeroed in Phase II of the zeroing process rather than the default, Phase I. 8 NO ZERO/NOHOME – Intended for lathes that have extra tools mounted on the outside of the turret. If this bit is set to zero, it will have no effect. If it is set to 1, the associated axis will not move when Power Up/Restart, Home G28 or Auto All Axes is pressed. The reason for this feature is to help prevent collisions between tools mounted on the outside of the turret and a sub-spindle mounted on the tailstock. It is important to note that a single axis Home G28 (e.g., press Z then Home G28) and any G28 specified in a program will still cause the axis to move regardless of the value of this parameter bit. The operator must exercise care when commanding any axis move. 11 Y REVERSE DIR – Reverse direction of power to motor.